Published on July 6, 2018. 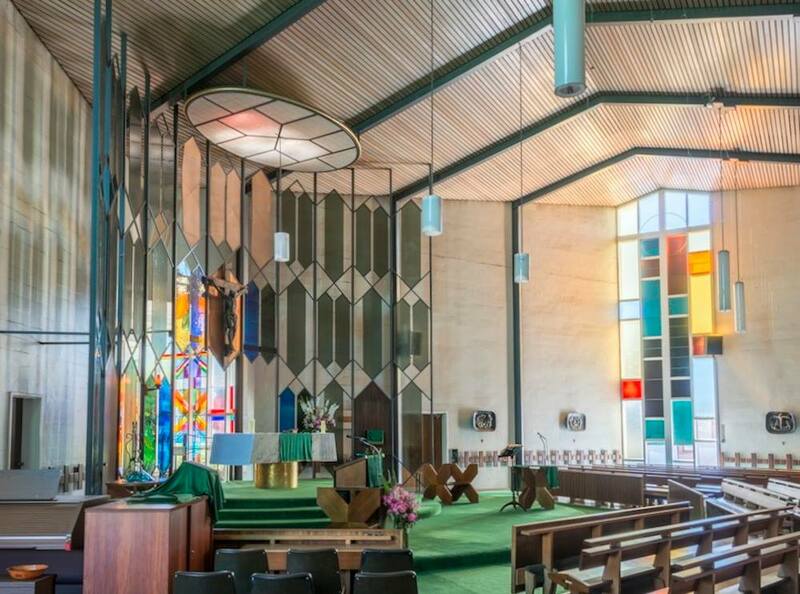 The National Trust has called on the City of Banyule to urgently apply to the Minister for Planning for an interim heritage overlay for Mary Immaculate Church, Ivanhoe, designed in 1960 by prominent local architecture firm Mockridge Stahle & Mitchell. This follows a decision by the Heritage Council of Victoria that the building does not reach the threshold for inclusion in the Victorian Heritage Register, and a referral to the City of Banyule for consideration for an amendment to the Banyule Planning Scheme. We believe that the Mary Immaculate Church has clearly demonstrated architectural and aesthetic significance to the City of Banyule, providing a strong case for protection under the Planning Scheme, and for a request to the Minister for an Interim Heritage Overlay. 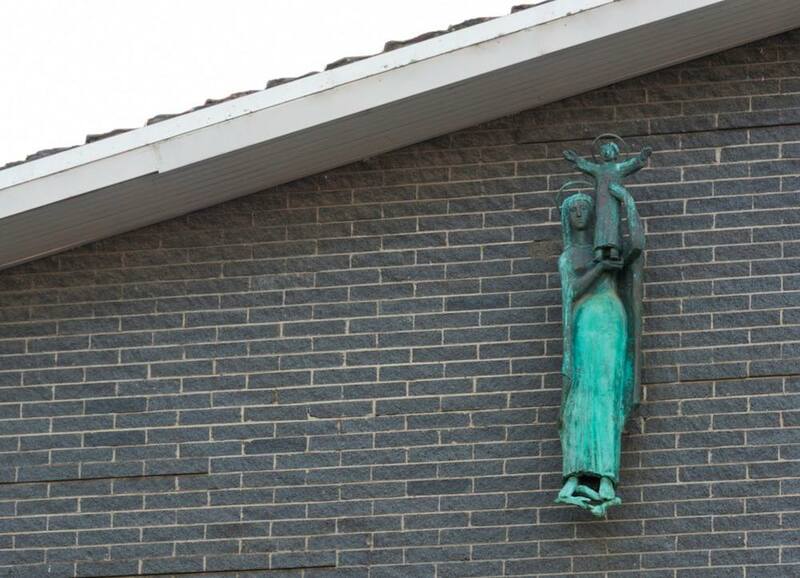 The campaign to protect Mary Immaculate is part of the National Trust’s focus on “Suburban Modern”, and the recognition and protection of post-war heritage more broadly, which is under-represented on the Victorian Heritage Register and local heritage overlays. Of 134 places of worship included in the Victorian Heritage Register, only 8 date to the post-war period. This is despite the historical significance of the surge in post-war construction to accommodate a booming population in Melbourne’s growing suburbs, which included the construction of hundreds of churches, many designed by prominent architects of the period. The two decades following WWII were a time of geographical expansion in many Australian cities. There was a huge population growth in the immediate post-war years, brought about by Australia’s strong immigration program and high birth rate, which in turn pushed the limits of Melbourne’s suburbs further outwards. Although many new churches were built across Victoria at this time, it was particularly necessary to build more churches (or sometimes replacements for existing small ones) to service Melbourne’s new suburbs in the city’s outer-middle and fringe areas. Many migrants also brought their own religions, or added their own cultural interpretations of the already established faiths. After post-war building material restrictions were lifted in 1953 there was something of a surge in church construction in Melbourne and Victoria from the late 1950s through to the early 1970s. The late-1950s to the mid-1960s appears to have been the most fertile period for church design, and the most intense period of church construction. In the decades following the human cataclysm of WWII, and with the growing possibility of nuclear warfare in the following decades, the design of many new churches combined Modern art and architecture in a renewed attempt to invoke a sense of the ‘numinous’ – a term popularised earlier in the twentieth century by the German theologian Rudolf Otto’s influential 1917 book Das Heilige, and which refers to mysterious or awe-inspiring spiritual emotion. During the 1950s and 1960s many of the Christian denominations also underwent liturgical reforms that affected the planning and layout of their church buildings. The most well-known of these was the impact of the Second Ecumenical Council of the Vatican (widely since referred to more informally as ‘Vatican II’), held in Rome between 1962 and 1965, although many of the Protestant churches underwent similar changes. The report also provides a detailed account of the design and construction of Mary Immaculate. 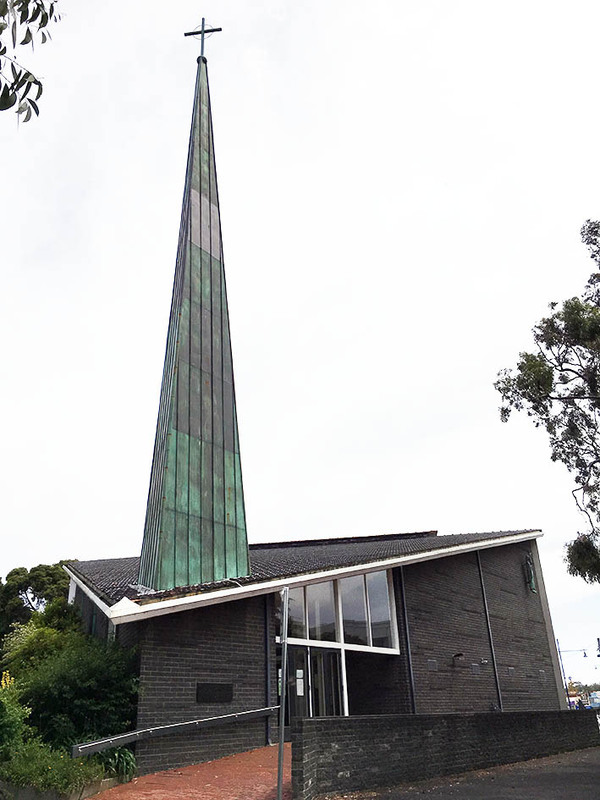 The Mary Immaculate Church was designed by the Melbourne-based architectural practice Mockridge Stahle & Mitchell in 1960, with its partner John Mockridge largely responsible for its design and detailing. The church was designed to accommodate a congregation of 450, and built to a total cost of £49,000. Its foundation stone was laid on 10 December 1961, followed by the official blessing and opening of the church by Archbishop E. V. Tweedy on 24 October 1962. Mockridge Stahle & Mitchell also commissioned artworks and leadlight windows by four prominent artists who were active in Victoria at the time. 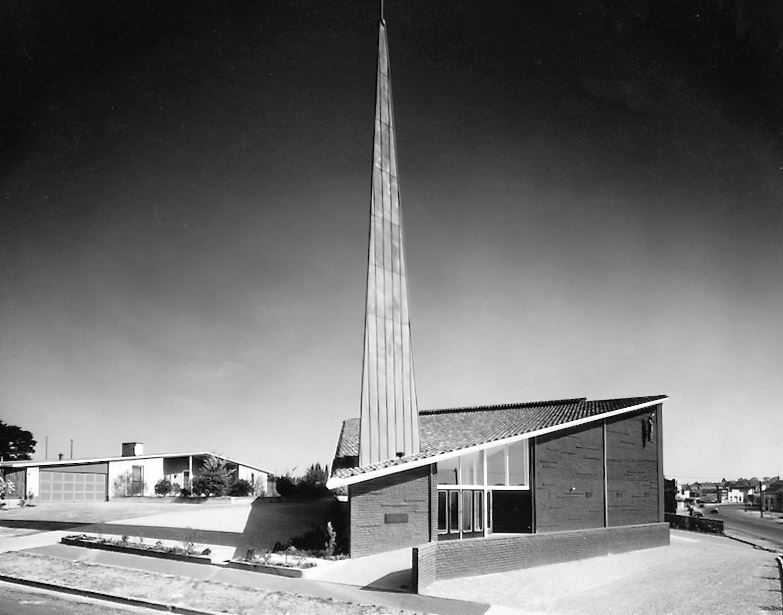 The practice of Mockridge Stahle & Mitchell contributed greatly to the city of Melbourne’s mid-century development, particularly with regard to its educational, ecclesiastical and domestic design work. The partnership was formed by the practice’s three principals – John Pearce Mockridge, James Rossiter (Ross) Stahle and George Finlay Mitchell – in 1948. The church remains substantially intact, including much of the original interior detailing, and stained glass and sculptures commissioned for the building. Mary Immaculate, Ivanhoe, 2016. Photograph by National Trust of Australia (Victoria). 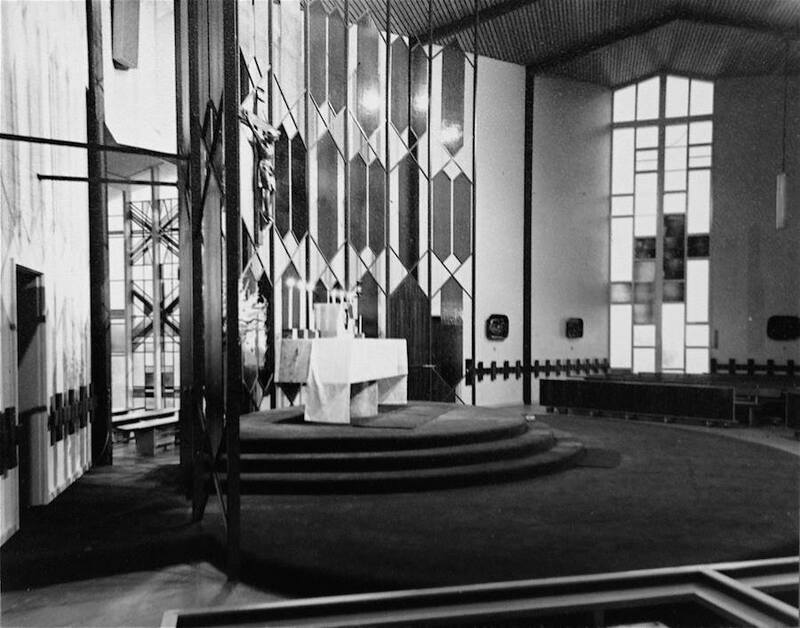 Interior of Mary Immaculate taken just after completion. Photograph by Mark Strizic. Interior of Mary Immaculate. Photograph by Paul Atkinson. One of sculptor Matcham Skipper’s 14 silver and bronze Stations of the Cross. Photograph by Paul Atkinson. Madonna and Child in bronze, by Hermann Hohauss. Photograph by Paul Atkinson. the spire it reaches down to a human scale. When I pass this building I always enjoy looking at it. very artistic and exceptional building. This is an iconic spire in Ivanhoe and part of the suburbs identity. It is should be protected for future generations and not eaten up by developers. It is a unique and true landmark of Ivanhoe and can not be replaced by some new modern development that may destroy it if it is not protected. I lived in Ivanhoe from 2001 to 2006 and walked past Mary Immaculate Church every time I went to the shopping centre. Its corner placement allowed passers-by to view the building from different angles and the building was an outstanding landmark for residents, visitors to the area and passing motorists. 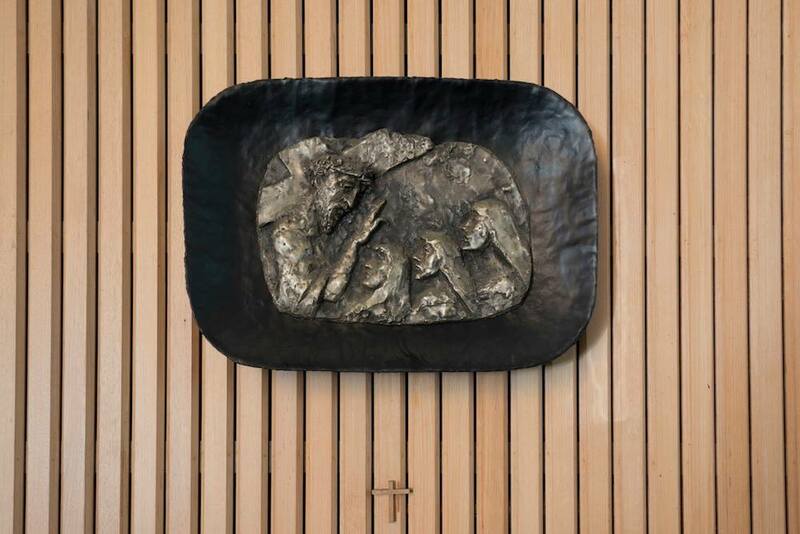 The architecture is very much in keeping with the 1960’s modernist style of the time, and is an important example of post-war church design. The stain glass windows and Stations of the Cross designed and crafted by notable artists, including sculptor Matcham Skipper demonstrate the care and attention to detail the architects paid to their design. This important Ivanhoe landmark should be protected.